We invite you for the Octavia Books Science Fiction Book Club discussion of Julie E. Czerneda's Beholder's Eye. The Science Fiction Book Club meets on the 2nd Saturday each month and welcomes all interested readers. We welcome you to join us! 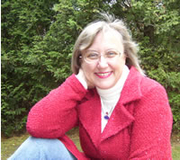 Julie E. Czerneda is currently considered a "single author." If one or more works are by a distinct, homonymous authors, go ahead and split the author. Julie E. Czerneda is composed of 9 names. You can examine and separate out names.